Finding a similar vehicle was more difficult than I had first thought. I wanted a 2013 Matrix (the last year that they were made), but only 2% of them were all-wheel-drive (AWD) like mine had been. I was looking for a grey one with no more than 60,000 kilometres. The search of the auto websites over many weeks was discouraging and stressful, and I had to remind myself continually to thank God that He had it all under control. In the centre of the graphic, the word "WAIT" appeared in 3-centimetre-high capital letters that were impossible to ignore as a sign from God! After I had released the hold on the 2009 Matrix, the Lord reminded me that I had bought replacement insurance on my original car that would give me back what I had paid for it, plus five percent for each of the two years that I had owned it. Three weeks later, my benefit was approved, but the insurance company insisted that I had to deal with the Honda dealership from which I had purchased the insured vehicle. Meanwhile, I was out of the country visiting my son and family near New York City. That very day, a vehicle exactly matching my ideal description was advertised at a Toyota dealer back home, but they would not release it to the Honda dealer until it had been in inventory for 90 days! It was really complicated, and I was out of town. I felt so helpless! It would take a miracle to actually purchase it. After a week, I remember writing an email to a lady who had been praying faithfully for months about my problem, and I told her that I had released the potential car to God to do whatever He wanted to do with it. Within five minutes, I received an email that the Honda dealership had agreed to allow me to buy the car from the Toyota dealer. I was immediately able to make arrangements to purchase the car a week later when I got home. It was a year newer, with 70,000 fewer kilometres and two model styles up from my previous vehicle — and all for the cost of a $600 documentation fee! Whatever your situation, the same principles apply: Pray, giving thanks in your circumstance, thanking God that He has it all under control, releasing your situation into His hands to do what He will with it, and then waiting on the Lord! Such expressions of trust enable God to pour out upon us the very blessing that He intends! Hi Robin, isn’t it great when God gives us the desires of our heart when we WAIT? Excellent! We are so quick to jump on things! God’s timing and our submitting to it are lessons we all need to be reminded of! Thanks. Thank you for writing and sharing this great testimony with us. Praise be to God!! Amen. Great example! Thanks for this example of your faithfulness and also for your vision in getting PresbyCan Daily Devotional started! Always a solid start to the day! We don’t hear from you very often but I sure need this insight right now for a situation I am facing. Thank you. Thanks for your great message. I could really relate as I, too, had a Toyota Gray Matrix that I really, really liked. God bless you and safe driving. That was so complicated only God could work it out! God’s Word for me in 2018 is Wait, and he’s shown me innumerable examples throughout the year – including this one – of trusting in Him. Good to see one of your devotionals after quite some time. We do indeed need to be thankful for the things we receive from the Lord, every day. Sometimes at the most unexpected times. Thank you for telling your true story of being blessed by God. I hope you will continue to find the vehicle just what you need. They that wait on the Lord. Thank you for writing today’s wonderful devotional! Waiting on the Lord can be very trying indeed to us, His children. I know this because I’m not very good at it! Your testimony here is so encouraging, and one that I’ll probably remember for the future. Thank you again, it really spoke to me. Very good devotional this morning. Thankfully you and your wife were not injured in the accident. Your devotional is an excellent reminder for us to be patient and “wait upon the Lord”, for truly He has the best solutions to our situations. WOW, Robin as I read your devotional, these words came right to my mind immediately, “Trust and Obey for there is no other way to be happy in Jesus than to trust and obey,” words to a familiar hymn as you know. You surely did that in your wait. Thank you for sharing this with us to remind us that no matter the situation God is faithful, we just need to always Trust and Obey. So glad to know you were rewarded in your patience and I assume you and Evelyn were not seriously injured. Merry Christmas. Your devotional is another reminder for me to wait and place all into God’s hands. I am finding this hard to do because taking care of both my husband and responsibilities that come with daily living, I have to make decisions right away and waiting on the Lord would not work. I have found a new passion that I never knew I had: painting. It is a great stress relief. Thank you for the reminder. Wishing you and your family a peaceful Christmas season and a healthy new 2019. I was interested in your devotional today. I have a Toyota Matrix which I really enjoy. I only have 94,000 + on it. Unfortunately, I was in a minor accident in March. No one hurt physically. Fortunately, the insurance paid all but $500 of the bill, and it looked like a new car when I got it back. Insurance also covered a rental while my car was being fixed. Trust all is well otherwise. Wow! Just what I needed to hear this morning, as our daughter’s 2010 Mazda sits in our driveway waiting to be sold. We had to take the insurance off it yesterday as she can’t afford to keep paying it. She bought a different vehicle a couple of months ago that was AWD which she really needs in the winter months where she lives and it was selling for a really good price. I am such a worrier though and your message reminds me to trust the Lord in this situation as in every circumstance. Blessings to you and yours this Christmas. This was an exciting devotional! I wish you could have seen the look on my face and feel my spirit jump for joy at the outcome of you ‘waiting on the Lord’. This happens so many different times in so many different situations, it is a shame more people do not have the patience to wait and see what God can do and remember no matter the situation, God is always in control. Thanks for this devotional, was a great reminder… to wait on the Lord. God bless and enjoy your miracle vehicle!! As I read your devotional, I thought how God provided such good for you out of this incident by protecting you from physical injury when your car was damaged. Truly you have been blessed. 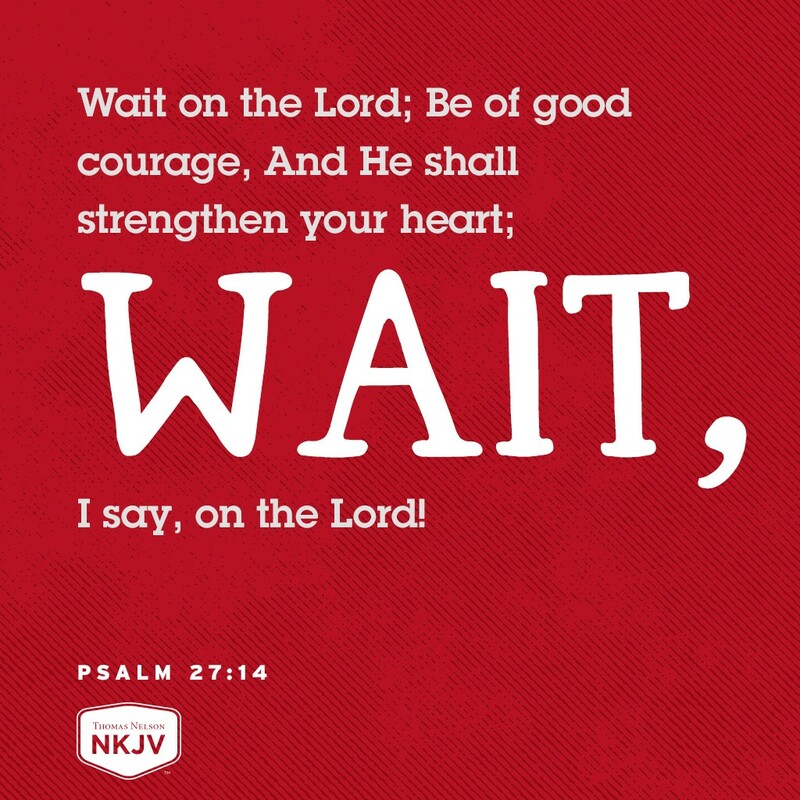 Thanks, Robin, for sharing this devotional lesson about waiting on the Lord. During bad weather last week, I received an e-mail stating that an order that should have been delivered was placed on hold. The order contained much needed pet food. I decided to wait until Monday to call the store. I prayed placing the AWOL order in God’s hands. The pets weren’t going to starve on dry pet food. Today, Sunday, it was delivered! PTL! Now the animals will have their preferred food. Are they spoiled? Yep. God does note when a sparrow falls…or when a dog and cat want their favorite food. Thanks for sharing this story with us. Blessings. What a good story and a happy ending. Before I bought my new car I prayed to God to guide me, was it really time to give up the old car in favour of new with all the latest safety nannies aboard. I waited for 5 months and finally took the plunge. I know we are to wait, be patient, and that all things happen in His time. I waited, listened and failed to hear/see His answer. I would need that big red sign to know for sure. I continue to pray for self, family, friends, neighbours, and people I just do not know about more serious stuff like well being and real health problems / issues. I believe in the Power of Prayer like those that prayed fervently for James when Herod put him in jail, having already put Peter to death.